Would you rather die too soon – – – Or too late? Medical technology overly-extended her father’s life. 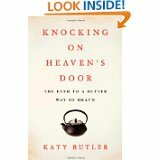 After her father died, her mother refused any interventions at the end of hers. Her stroke-disabled 79 year old father was told he needed a hernia operation, which the surgeon would not perform unless his age-induced slowed heart-rate was controlled by a pacemaker first. In the end, his pacemaker kept his heart beating beyond all reasonable quality of life. The ensuing 6 years, including increasing dementia and disability, as well as petitioning to have the pacemaker turned off, motivated her mother to refuse heart catheterization at age 84. She died 9 months later, peacefully. Her heart just stopped. What would you do? Or, more to the point, what WILL you do – How will you help your parents, your spouse, yourself, think this through? Every single cell, neuron, and synapse in our brains is designed to keep us alive. We are built for survival, and it takes great mindful effort to override that primal drive (unless our brains are incapacitated by mental illness. That’s a different topic.) Our medical technology has colluded with this goal: Survival at all costs. All of us wish we could live long and healthy lives until we die in our sleep. But we don’t realize at a certain point, medical interventions prevent a peaceful death. Or rather, we can’t decide when to refuse medical interventions. And most of us watch our loved ones die too late, and may suffer the same fate. Blair was telling me how his mother, at 74, had open heart surgery, and never regained her mental or physical strength. This is exceptionally common when older folk head to the hospital – Hospital induced dementia – induced by the confusion when we’re being woken day and night for “necessary” vital sign checks, in unfamiliar and often frightening environment where we have little control. On the other hand, Blair just had similar surgery at 77, and has recovered fully. In fact, he was at church doing repairs. So how do we decide? Past a certain age, “preventive” tests are no longer covered by Medicare, and initially we’re indignant – Why won’t they pay for my …. mammogram; colonoscopy …. etc. Well, because whether we like it or not, at a certain point, in our older and more fragile physical state, the cure will kill us faster than the disease. Or at least leave us so debilitated, if we’d known what would happen we would not have agreed to treatment. These are not easy questions or conversations. But they are necessary. And here in the States, our doctors are sometimes afraid not to intervene, and other times simply not as ethical as we would hope: A surgeon gets paid for doing surgery, not for taking even the same amount of time for talking us out of it. So, would you rather die too soon – – – Or too late? More to the point, are you willing to have the conversation with yourself, your family and close friends, your doctor? Are you willing to give up a month or a year of quality, or risk that you will die too late? It’s something we all would do well to think about. Especially at every single doctor’s office, when yet another test and intervention and surgery is being recommended. Especially as we all grow older. There are fates worse than death. This entry was posted in Uncategorized and tagged brain, death, dementia, disease, dying, end of life, heart disease, hospital stay, katy butler, knocking on heaven's door, medical interventions, medical technology, medicare, neurons, pacemaker, preventative care, stroke, surgery, survival instinct, synapse. Bookmark the permalink. As the body fails and medicine can no longer restore us, I would rather move on. I look forward to one of those resurrection bodies that can pass thru walls and eat fish at the same time! I love your comment, Art! But the challenge is figuring out exactly when to start passing on the interventions – Because it’s so hard to figure out how we’ll feel in the future – But the medical profession doesn’t always do a great job at letting us know the risks we take when we go in for surgery, chemo, etc. Medicine is dedicated to preserving life. In five trips to the operating table, I have issued an advanced directive not to preserve my life by artificial means. It comes down to personal preference.